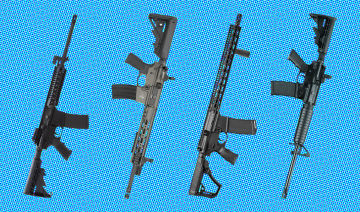 So you just picked up a new AR-15 or finished a fresh build and you’re itching to send some rounds down range. Well, before things get too crazy, you need to make sure your weapon is properly zeroed. If you’re new to the AR-15 game, I know this can be intimidating. I’m here to tell you, though, it’s dead simple. I’ll teach you how to zero an AR-15 by taking you step-by-step through the process. Have a little more experience? You’re welcome to come along for the ride, too. If you’re like me, then you’re always up for learning something new. In this guide I will show you how to zero your weapon at 50/200 meters. This is my preferred zeroing distance because I know that my point of impact will be about the same at 50 and 200 meters. Zeroing at this distance also keeps the point of impact within 3 inches, up or down, of your point of aim from 0 to 250 meters. Simply put, the projectile will hit within 3 inches of what I’m aiming at inside of 250 meters. These distances are most usable for me, and should be for a lot shooters. For reference, the chart below shows your point of impact when zeroing at other popular distances. The whole thing begins with a good mechanical zero. This process sets your sights to the center and flush position, giving the maximum level of adjustment for windage and elevation. Know that this does not mean your AR-15 is zeroed, per se. While it’s possible that your point of aim and point of impact will line up, it’ll probably need additional adjustment. Also note that you may be unfamiliar with some terms. I’ll do my best to explain them here, but if you have any questions feel free to reach out to me via the contact page. There are a lot of front and rear sight options on the market. As such the method you use to mechanically zero your AR-15 may be different from what I present here. However, the concept is the same and you should be able to accomplish this task with little difficulty. And, as a rule of thumb, always consult the manufacturer if any problems arise. To make things easy, I’ve listed all the tools and steps you need to take to mechanically zero your AR-15. 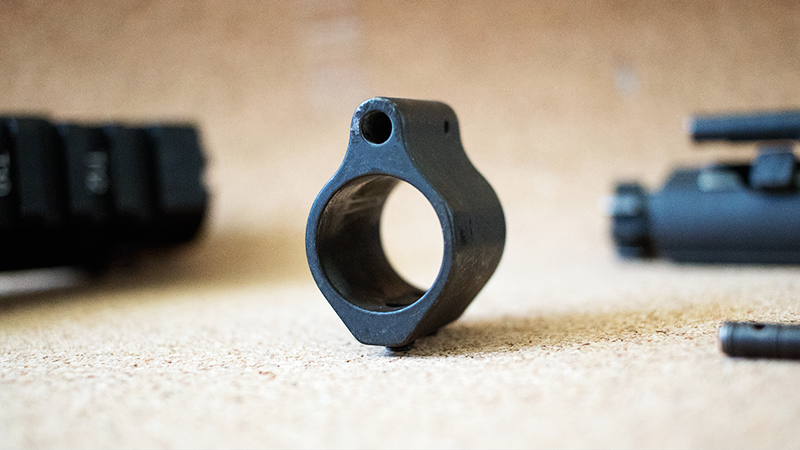 Using the front sight tool, adjust the front sight up or down until the base of the front sight is flush with the front sight post housing. 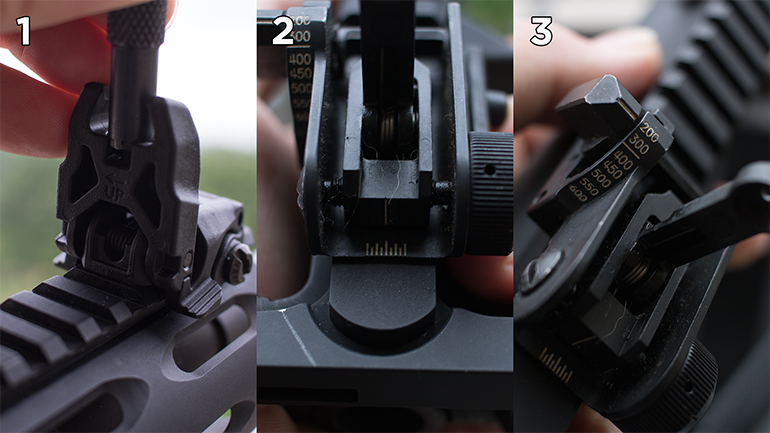 Rotate the windage knob on the rear sight to align the index mark on the aperture with the long center index line on the rear sight assembly. Adjust the elevation knob on the rear sight to the proper height based on your zeroing distance – in this case 200 meters. For rear sights with the 6/3 marking, set rear sight to this mark and adjust down four (4) clicks for 200 meter zero setting. For rear sights with the 8/3 marking, set rear sight to this mark and adjust down two (2) clicks for 200 meter zero setting. 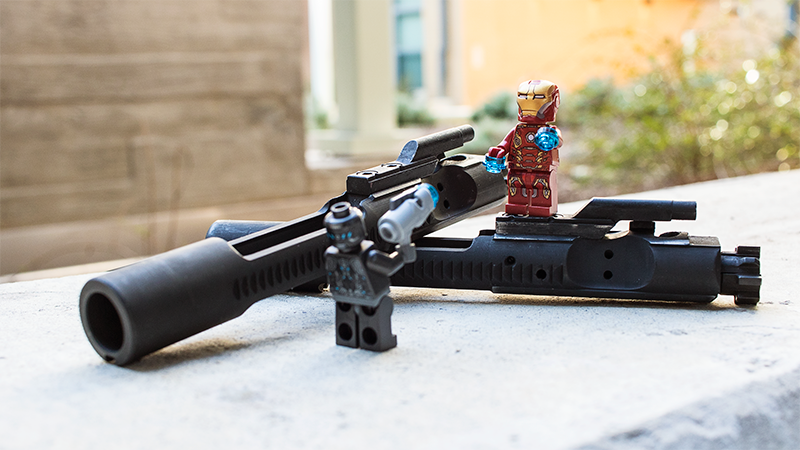 Now that your AR-15 is mechanically zeroed, it’s time to send a few rounds down range and really dial things in. 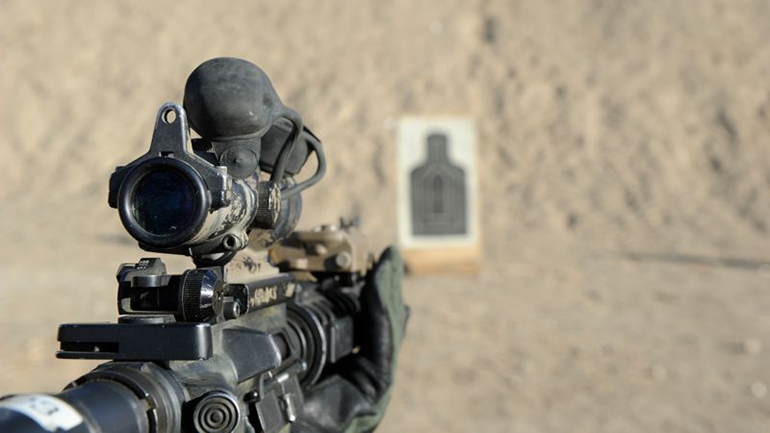 To start with, you’ll need to set up a zeroing target at 50 meters. If your range doesn’t go out that far, don’t worry, I’ll show you an alternative method for zeroing in closer quarters. The process from here on out is pretty simple. Once your target is placed, you’ll fire three (3) rounds at center mass and evaluate your shot placement. You will then make adjustments to elevation and windage based on your observation and fire three (3) more shots to verify placement. Simply repeat this process until the point of impact is the same as your point of aim. I’ve outlined the process a bit more below. After setting the front and rear sights to mechanical zero, place a 50 meter zeroing target down range at the 50 meter mark. Carefully aim and fire a three-shot group center mass of the silhouette. If your shot group isn’t within the circle on the silhouette, use the squares on the target to determine the number of clicks to move your next shot group into the circle. If your shot group is low, rotate the front sight up using the front sight tool. If your shot group is high, rotate the front sight down. One click will move the point of impact one square on the target. If your shot group is too far right, rotate the windage knob on the rear sight counterclockwise. If your shot group is too far left, rotate the windage knob on the rear sight clockwise. Up to three (3) clicks may be necessary to move the point of impact one square on the target. Fire another three-round shot group and make corrections until you have a tight shot group in the circle on the silhouette. Once your shot group is within the circle, your rifle is now zeroed. If you only have access to an indoor range, you can still attain a 50/200 meter zero with only 10 meters distance. The method I’ll show you here is very simple and you can achieve a zero very rapidly. Personally, I use this method even when I have the space since it is so quick. Going back to the table above, we can quickly determine that our point of impact will be between 1.1″ and 2.5″ lower than our point of aim at 10 meters when zeroed for 50 meters. Specifically, it will be 1.9″ lower in this case. To verify, you can zero your weapon at 50 meters using the traditional method I outlined above. Then, set a simple silhouette target at 10 meters and fired a round at center mass. 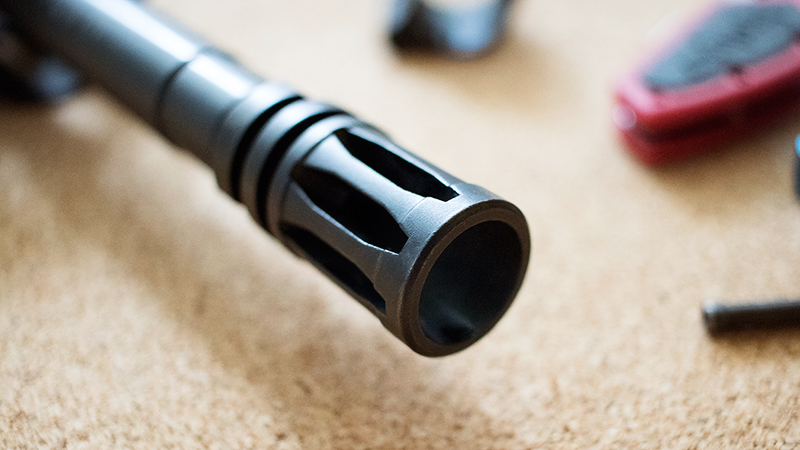 Your round should be about 1.9″ below your point of aim, give or take a little bit. Knowing this, we can use a special target that will give us a reliable 50/200 meter zero when set up at 10 meters. This target has two silhouettes, one for point of aim and one for point of impact. After setting the front and rear sights to mechanical zero, place a 10 meter adjusted 50/200 meter zeroing target down range at the 10 meter mark. Carefully aim and fire a three-shot group center mass of the top silhouette. If your shot group isn’t within the circle on the lower silhouette, use the squares on the target to determine the number of clicks to move your next shot group into the circle. Fire another three-round shot group and make corrections until you have a tight shot group in the circle on the lower silhouette. Once your shot group is within the circle, your rifle is now zeroed. Learning how to zero an AR-15 is simple, but it’s an important first step if you are new to the platform. I remember being unsure the first few times but I was able to pick it up pretty quick, and I’m sure you will too. I will also give you printable targets that you can use. Just sign up for my email list using the form on the top right and I’ll send you a link to my resource page. If you need anything else, I’m happy to help.